I am no stranger to writing about cab units favorably. 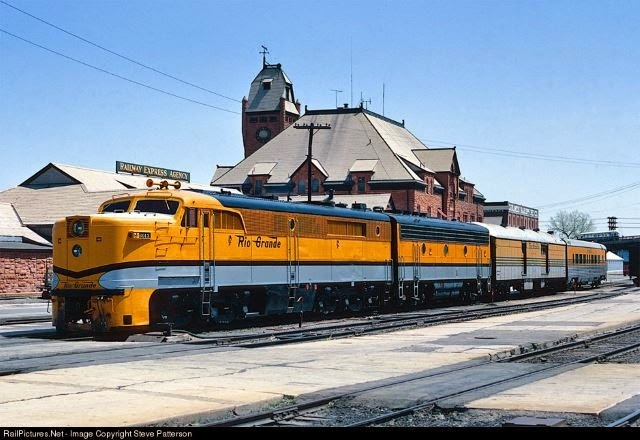 I have long loved the Rio Grande's parade of EMD F-units that roamed Colorado and Utah in the 50s and 60s. On the other hand, it took me a long time to become a fan of Rio Grande's Alco PA and PB diesel locomotives. Arguably, they are an ugly duckling when compared with her contemporaries. The Alco's cab is broad and flat, it's windows angular. What could have been a smooth, rounded nose is marred by a square grill housing around the pilot light. Nonetheless, the Alco is not without her charm. The cab has a softening line along her grills and a land yacht-like gracefulness that could be likened as a Cadillac to EMD's Chevrolet-esque appearance, a not-completely unfounded comparison, considering EMD's ties to General Motors. So why is an Alco PA our photo of the day? Quite frankly, because it's time I recognize the worthwhile love of Alco fans. The PA's lines and the radiant Rio Grande colors of the matched (mostly) consist are especially beautiful, balanced against the Manitou Red Sandstone of the Pueblo depot and a spotless Colorado summer sky are so memorable, that at the time of this writing, I haven't seen this picture in a week and I can still describe it with vivid clarity. That's a photo worth keeping!